Esperanto, Pocahontas, & The Rebirth of Brandon as the Don Bran Don. Crossing a mountain ford, somewhere, over the rainbow. Photo by John aka Mr.Dr. Brandon had not yet transmigrated into the Don Bran Don when we came down a narrow dirt track on Catoctin Mountain. His legs were worn pistons, eyes scared, glazed with pain and glossy with adrenaline. His 23mm tires, pumped to some ungodly track specific pressure, bounced over the tailings and pot holes with an appearance of abject abandon. Fibrous strands from his aging sidewalls twisted in the air, suggesting a beautiful impeding doom. I warned him of the upcoming hair pin, strewn with gravel. He needed to scrub speed fast. As he applied furious back pressure to his pedals, his chain popped off, and suddenly his only method of controlling the bike was disposed of. Well, almost the only method. “I still feel that variable gears are only for people over forty-five. Isn’t it better to triumph by the strength of your muscles than by the artifice of a derailer? We are getting soft… As for me, give me a fixed gear!” So spoke Henri Desgrange, Tour de France founder and publisher of Le Auto, a sport magazine. An ex pro cyclist, Desgrange raced in the time before advanced technology like “brakes” and “gears” were accepted or widely available. Octave Lapize trudges up the Pyrenees. Desgrange made his name on flat courses and in the velodrome, not places typically associated with a need to slow down, and say, not fall off a cliff. 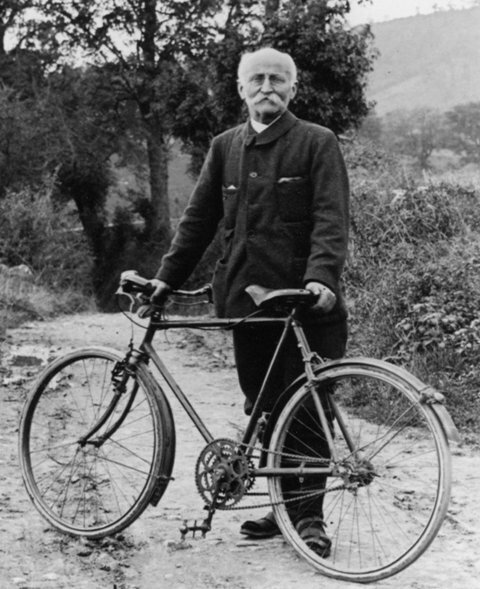 When founding the Tour in 1903, he was adamant about the type of bike to be ridden: generic, fixed gear machines, to keep the playing field as level as possible. When the Tour headed into the mountains for the first time, he allowed brakes, but no gears. Riders who sought a lower gear either dismounted and flipped the rear wheel to an easier ratio, or got off and pushed. Given that many of the roads were muddy goat herding tracks through mountain passes, sometimes pushing was the only viable choice. 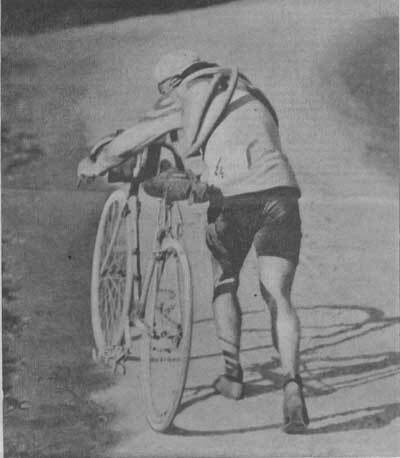 Paul de Vivie, aka Velocio, published Le Cycliste, chief competition to Desgrange’s Le Auto. Velocio was a staunch supporter of derailleurs, good brakes, and lightweight repairable bikes. The so called patron saint of Cyclo-Touring, Velocio, a fluent Esperanto speaker, was also a strict vegetarian. His riding style, adopted by many as a virtual religion, was to go long, go just fast enough, and to see the country. The Randoneuring style of riding is still practiced today, with riders doing unsupported rides ranging from 200 to 1200 kilometers, without significant rest breaks. Paul De Vivie aka Velocio with one of his bi-chain cyclo-touring bikes. Velocio, who spoke Esperanto, was often quoted as saying: "donu al mi rapidumojn aŭ donu al mi lifton." Actually, I just made that up, but if you can translate it, 10 points to you! He believed the only sustainable way to ride, and still get up into the mountains, was with gears. He thought it foolish that anyone would walk when they could be riding, a concept only possible with the use of variable gears. The division between the riding styles of Desgrange and Velocio were born at the turn the century and continued until Velocio’s untimely death in 1930, when he moved out of the way of an oncoming truck, he moved into the way of an oncoming tram… Desgrange eventually allowed derailleurs in the tour, but his minimalist credo continued well past his death. A quick reminder: This Tuesday, we’ll be hanging out at the Frederick Bicycle Coalition fundraiser, down at Brewer’s Alley in beautiful downtown Frederick. The Don himself, and this writer, both of whom are on the Board of the Coalition, will be there around lunch time, and again, in the evening. It’s the most painless way ever to support Frederick bike advocacy. You just come, drink beer, eat food, any time of the day (as long as it’s this Tuesday!) and Brewer’s hands the Coalition over a chunk of that money. We’ll use it help put in bike lanes, bike racks, and put in a City Pump Track. We also, for what its worth, work to keep the tiny country roads that we love riding on, small and slow, so people don’t drive like nutter butters on them. So all in all, a good reason to come out and drink lots. We’ll be in the lobby, with shirts, which you should buy, because I designed them, and they are cheap. Also, we’ll have water bottles, stickers (free!) and newsletter sign up sheets, because you need more things in your inbox. You know this, hopefully, but if you join the FBC (it’s cheap) you’ll get 15% off on almost all the accessories we sell. Not on bikes, not on service, but that’s a helluva a deal, nonetheless. Tuesday: No ride. We’ll be at Brewer’s, kicking out the Jams. You should be, too. Thursday: 7 am ride. We will be there, with bells on. Usual place: 7th street Starbucks. 40ish miles. Relaxed post new years Christmas spare tire pace. We’ll go somewhere interesting, back before lunch. bike doctor in the world at large, Cyclo-Touring, Dirt Road Riding, Frederick Bicycle Coalition, Frederick Riding, Lots of Pictures for the Illiterati, Meaningless Quotes, Pass Hunting, The DonBranDon, Things you should be into, Tour de Francebi-chain, bike doctor, bike doctor frederick, Brantonio Branderas, dirt roads, dirt roads in frederick county, DonBranDon, FBC, frederick, frederick bicycle coalition, Henri Desgrange, Lugged Steel, Octave Lapize, pocahontas, Velocio, Vintage Trek, what's your epic?